Having an excellent network of roads and communication facilities, Himachal has a clean and peaceful environment. Himachal Tourism a pioneer in the development of tourism infrastructure in Himachal, has Himachal's largest complete package of tourism services, including accommodation, catering, transport and sports activities. Himachal Tourism has divided the state into four interesting circuits. The Sutlej Voyage circuit passes through the shiwalik foot hills through apple orchards, forests of pine, oak and deodar, majestic monuments of the Raj, snow covered ski slopes and the furious Sutlej river. This circuit covers Delhi - Rohru - Rampur - Sarahan - Narkanda - Naldehra - Tattapani - Shimla - Kiarighat - Delhi. This voyage also includes Renuka, Paonta Sahib and Nahan. Area 55673 sq. km Population 5.2 million Literacy 64% Average rain fall 1400 mm. Climate-temperate. Season: Winter (Dec-March) Av. temp. -5C to 25C in lower hills. -5C to 15C in mid hills Summer (April-June) Av. temp. 15C to 35C in lower hills. 10C to 25C in in mid/higher hills Monsoon (July 15th-Sept.) Av. temp. 15C to 30C in lower hills. 10C to 25C in mid/higher hill Nearest Railway Station (Broad gauge) Chandigarh, Kalka, Pathankot and Nangal. (Narrow gauge) Shimla, Jogindernagar. Rohru - Chanshal - Dodrakwar - Rupin - Sangla; Sangla - Badrinath; Jalori pass; Chandrakhani - Pass (Kullu Manali - Chandratal Manali - Parvati valley Dharamsala - Triuns - Chamba Bharmour - Manimahesh Chamba - Kullar over Sach pass; Bharmour - Baijnath; Bharmour - Lahaul; Chandratal; Barashigri glacier; Kinner - Kailash Bhaba - Pin Valley. 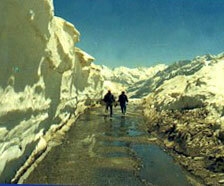 (1) Skiing and Ice Skating: (January to March) Solang Nalla (Manali) Narkanda and Rohtang Pass. Ice Skating Shimla, Heli-skiing Manali. (6) Wildlife Parks and Sanctuaries: Great Himalayan National Park Parvati Valley, Kullu. High altitude Pin valley National park, Spiti. Renuka Sanctuary, Pongdam Sanctuary, Sarahan Phasentry, Kufri and Gopalpur zoo. (8) Lakes: Prashar, Khajjiar, Renuka, Gobindsagar, Dal, Pongdam, Pandoh, Manimahesh, Brighu, Chandratal. (9) Temples: Jwalamukhi, Chamunda, Brajeshwari, Chintpurni, Baijnath, Laxminarayan, Chaurasi, Chhatrari, Taranadevi, Rewalsar, Raghunath, Bijlimahadev, Dhungri, Bhimakali, Hatkoti Jakhoo, Sankatmochan, Kalibari, Nainadevi and Baba balak nath, Deothsidh. (10) Buddhist Monasteries: Dharamsala Tashizong, Rewalsar, Manali, Kardang, Sashur, Key, Dhankar, Tabo, Nako, Pooh, Kanam, Jangi, Murang, Ribba, Reckongpeo. (11) Sikh Pilgrimage Centres: Paonta Sahib, Rewalsar and Manikaran. (12) Churches: Christ Church Kasauli, Christ Church Shimla, St. Johns Church, Mecleodgang, St. Francis Dalhousie. (13) Fairs: Winter Carnival Manali, (Feb.) Mandi, Shivratri (March), Ladarcha fair, Spiti, (July) Minjar fair, Chamba, Manimahesh fair, Bharmour and Tribal Festival, Keylong (August) Phulech (festival of flowers), Kinnaur (Sept.) Kullu Dushera (October), Lavi fair, Rampur (Nov.), Renuka fair, (Nov.) Ice Skating Carnival, (Dec.). (14) Heritage Monuments: Kangra fort, Taragarh, Rampur, Nalagarh, Arki and Jubbal palaces, Bhimakali Temple, Naggar Castle, Kamru fort, Gondla fort (Lahaul Vice regal lodge, Christ Church, Chapslee, Wood villa palace, Chail Palace. (15) Museums: State Museum, Shimla, Kangra art Gallery Dharamsala, Bhurisingh Museum Chamba, Roerich art gallery Naggar, Sobha Singh art gallery Andreta.